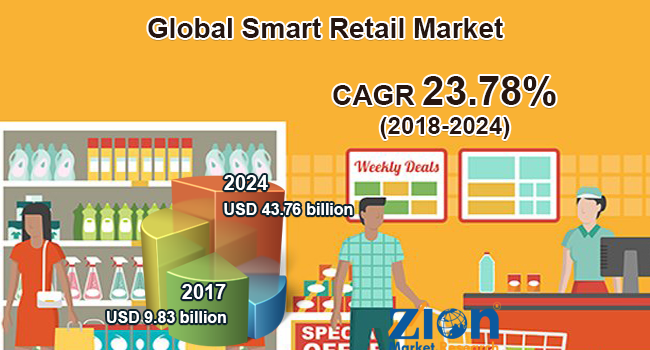 Zion Market Research has published a new report titled “Smart Retail Market By Technology (ZigBee, Wi-Fi, Bluetooth Smart (BLE), LPWAN, And Others) and By Application (Smart Payment System, Robotics, Analytics, Indoor Navigation, Visual Marketing, Smart Label, And Others): Global Industry Perspective, Comprehensive Analysis And Forecast, 2017 – 2024”. According to the report, global smart retail market was valued at approximately USD 9.83 billion in 2017 and is expected to reach approximately USD 43.76 billion by 2024 growing at a CAGR of around 23.78% between 2018 and 2024. Retailers have been facing an increased conflict against e-commerce companies in capturing the customer attention. Most of the leading retailers today have their own websites that meet the responsive web design and also have mobile apps in order to retain their existing consumers. One of the biggest challenges is to convince shop visitors who compare retail shopping and then end up buying items on e-commerce websites. The smart retail solution is the answer to this challenge. The hardware part of smart retail solution consists of beacons, sensors, and cloud-based technologies that are managed in the backend. Increasing need for better customer service in order to tackle the e-commerce shopping is driving the growth of smart retail market across the globe. Consumers often talk about their shopping experience when they buy items from retail outlets, especially if it is uncommonly good or poor. With strong customer service, retailers can make use of word-of-mouth advertising which is the effective marketing tool. Decreasing cost of electronic components is further expected to spur the demand for global smart retail solutions. Furthermore, an increasing number of connected consumers will fuel the growth of smart retail market globally. Connected consumers do not want to find their shopping store online or in their neighborhood. They want a consistent store presence with consistent service every time. The smart retail system helps retailers to find these consumers. However, the high maintenance cost of advanced computer systems and infrastructure may restrain the adoption of smart retail solutions across the globe. The smart retail market is segmented based on technology, application, and region. On the basis of technology, the market is segmented into ZigBee, Wi-Fi, Bluetooth Smart (BLE), LPWAN, and others. Applications of the smart retail solutions are smart payment system, robotics, analytics, indoor navigation, visual marketing, smart label, and others. Among applications, robotics segment is anticipated to grow significantly in the global smart retail market. A robot simplifies the process of finding the right product for the customer, and it also manages the shelf inventory and backend process for the retailer. Additionally, robots make use of inventory scanning and auditing software to analyze the retailing process. The regional segmentation includes the current and forecast demand for North America, Europe, Asia Pacific, Latin America, and the Middle East and Africa. Among region, North America is anticipated to have the largest market share in the global smart retail market. This is primarily due to the increasing adoption of omnichannel retailing across the U.S. Most of the American retailers have adopted an omnichannel retailing strategy to increase their sales. According to a market study conducted by the Happiest Minds Technologies, 64% of the U.S. retailers had adopted omnichannel retailing by 2015. Major players operating in the smart retail market are Nvidia, Samsung Electronics, Intel Corporation, IBM, Microsoft Corporation, Amazon, NXP Semiconductors, Google Inc., PTC Inc., Cisco Systems, Huawei Investment & Holding, and LG Display, among others.